It's an exciting moment for our programming team - and for all of you who donated earlier in the year to make our Baby Box programme happen. 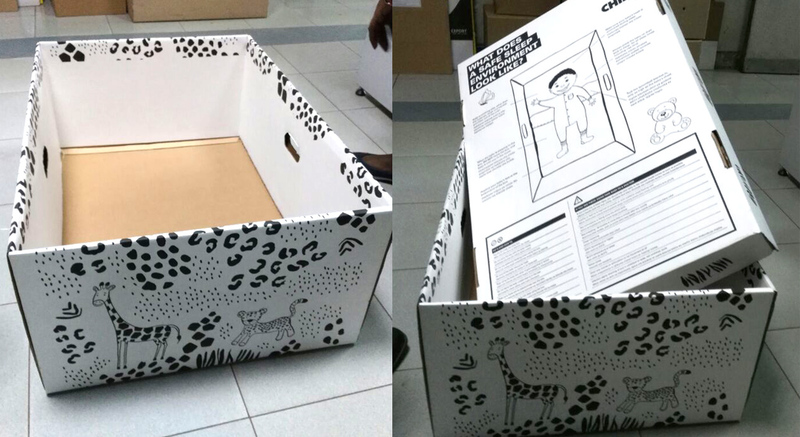 We have been working hard on the development and design of the Baby Box. And we are proud to show you the first result! The box can be folded into a flat pack which will make it easy for mums to carry it from the hospital. The products that will go into the box (the mattress, mosquito net, sheets and blanket) are still being manufactured. But we are very happy with the result of the cardboard box! The box is manufactured by a factory in Nairobi. This is because we want to help mothers in Nairobi but we also want to be mindful of the local economy by not importing products but working with local manufacturers instead. This does bring some extra challenges, but we are very happy with the result! Featuring illustrations by Jaqueline Fryers, the lid of the box has advice on safe sleeping in both English and Swahili, and some warning signs to look out for in newborn babies, encouraging parents to take their baby to a health centre if they suspect something is wrong. Our next steps will be to distribute the boxes to the health facilities we will be working with. They will be able to hand out the boxes to new mums who have registered and who hand in their baby box voucher during their and their baby’s postnatal check-up at the health centre. (There is some more info in our previous blog here about how this will work). This survey is going to give us more information about the situation of the mothers and their babies in Nairobi, with a focus on their experiences in the maternal healthcare system. More on all this soon! For more information on the Baby Boxes project take a look at child.org/babyboxes.